Doreen Simmons has been in Japan since 1973, writing feature articles, editing, acting, recording, and with a sideline as one of the few foreign female Sumo experts, including being a live commentator on NHK’s worldwide satellite service. [See Newsletter No. 71, “A Day in the Life.”] From 1996 to 2003, she kept SWETers on the straight and narrow with her entertaining SWET Newsletter column of solid advice, “Ask Aunt Eva.” The 24 popular “Aunt Eva” columns are still relevant for numerous dilemmas wordsmiths face in their daily work, and still deliver a smile along with sound help. They have been republished in their entirety on the SWET Web site for both nostalgic and new readers alike. On this auspicious occasion, SWET interviewed Simmons about her stint as an advice columnist. Q: What got you going with being Aunt Eva? Had you done this sort of advice column before? I had a sumo column in Kansai Time Out from 1983 until the magazine’s demise in 2009 and wrote a long series of “Sumo: Then and Now,” half-page columns in the also-defunct Sumo magazine. This was my first foray as an “Agony Aunt” for wordsmiths. Q: You signed yourself, “Eva Hartupp,” and used puns for names of those asking advice. Surely you did not mean, “Eva hard up”? DS: Oh no, no, Aunt Eva was never hard up! The name is a British insider joke. To ‘heave one’s heart up’ is to vomit violently. I recall one concerned mother describing her daughter’s morning sickness thus: “Every mornin’ she’d ’eave ’er ’eart up!” and so ‘Eva Hartupp’ was born. This was the first of my puns—not my usual form of humor; it simply happened. Possible pseudonyms for the writers of the questions came to me in batches; I kept a collection at the end of my template, and picked the most suitable. Occasionally the person with the problem suggested one. Q: Aunt Eva seems to be an elderly, wired-up, pensive, lovable old tabby, first mentioned in your eighth column, and five more times until appearing in the final column. Was there a real “Aunt Eva”? DS: Ahh, the cat. I don’t remember exactly when it happened. 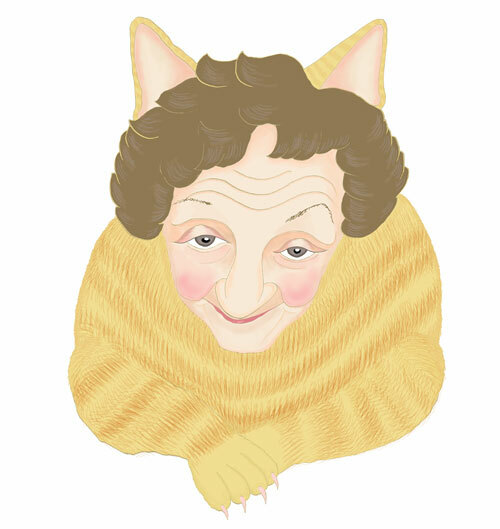 Eva Hartupp started out as a large, imposing woman of uncertain age, probably a former magistrate such as I had once played in The Mousetrap; but quite soon I turned into a large, warm, furry, elderly tabby cat, generally benevolent but with the typical short fuse of the cat, and the claws always there, and only temporarily sheathed. 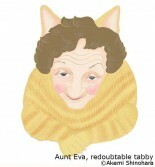 There never was a real cat; Aunt Eva is an alter ego. She is me when I am being a cat. If you have seen me on stage, or heard me doing readings or voice-overs, or singing electrifying folksongs, you would understand that I am a natural characterizer. She acted as a useful filter; an emotional one rather than an intellectual one. Q: Were the letters genuine? Many hit on situations a lot of us lived at the time. DS: The problems were always real ones, but the actual letters varied a great deal. Some came directly from SWET friends and were printed as received. Some arose from correspondence, or from real-life problems I knew of, and in these cases I asked the people concerned for permission to work their problem into a column. In these cases I also changed details to disguise the origin, sometimes the gender of the writer, or the nature of the work. ‘Helena Handbasket’ was actually a man, and the spark came from a question he put to the SWET-L list. I waited a suitable time and then asked if I could use it. The catalogue one by ‘Bubbles R. Poppin’ arose from an email correspondence with a woman compiling a high-powered catalogue of netsuke for a big-name museum in the U.S., who had asked for my help with the descriptions of a couple of sumo-related netsukes. I asked her permission to use her off-topic comment as a spark, and she readily agreed and said she’d always fancied ‘Bubbles’ as an alias. In other cases, the subject arose from my own work experience, and both the letter and the answer were by me. The only one purporting to be from a Japanese translator was real enough, but I put into letter-and-answer form the conversation I had had with a colleague. The examples were true, but it had been a discussion not a letter to an unknown agony aunt. The letter from the man who had done two years of English teaching and thought he was an expert (‘B. Lowe Parr’) was a pastiche of three genuine utterances. Whatever the origin of the letters, however, the answers were all true-life cases, sometimes provided by friends, more often from my own experience. Q: Did you hear from readers about your columns? DS: Like a number of columnists, and much as bloggers do today, I tended to regard the column as a means of getting things off my chest rather than actually giving advice, and I was sometimes surprised to receive appreciative responses. The column that got the biggest response was “Burnt out” by “Ivor Nottacleugh,” in the September 1999 issue, about a freelancer “tired of translating and rewriting the same old superficial topics year after year.” In my youth I once had a bout of clinical depression, so I recalled exactly what it felt like; having had no relapse I felt that I might have something worth passing on about dealing with burnout. SWET: My personal favorite column was “Beginning as We Mean to Go On,” in September 2001. Besides getting me to think about the immediate question of how I wanted to be addressed in a new Japanese workplace, connected, in my case, to my choice of name order on my meishi, I learned the time- and stress-saver of planning ahead for things, and shamelessly borrowed and used Aunt Eva’s words in various places over the years. Q: After November 1993, readers were sorry to no longer find “Aunt Eva” in the Newsletter. Did you move on to other projects? DS: The series ended, quite simply, because I ran out of new things to say. I had a few letters in hand, but they weren’t Aunt Eva material—either that or I had already covered the ground. Or perhaps there is still a block caused by unfinished business. The one time when Aunt Eva had to apologize for not sending in a column was when real life got too close. An ambitious man intent on knocking out all possible competitors caused a lot of hand-wringing and widening circles of professional damage. A perfect job for Aunt Eva to tackle, you might say. Unfortunately it was too close to home, and the story still lacks the sting in the tail that is Aunt Eva’s preferred ending. So perhaps the series is not yet over and done with.